This part provides information about how to manage the running state of your ECS instance. ECS Instance Automatic Recovery is a feature of Alibaba Cloud. It is designed to increase instance availability. If an ECS instance becomes impaired or terminated due to its underlying hardware problem or failure, an identical instance with the same instance ID, private IP address, Elastic IP address and all instance metadata, will be recovered on a different piece of hardware. Users will receive an email during the recovery procedure. Please check more details from here. You can stop one or multiple SAP NetWeaver hosts at any time. Stopping an ECS instance means shutting down the instance, you can do this via ECS Console. See here for more details. Make sure that you should first stop SAP NetWeaver, before you stop the instance. Note: The private IP assigned to the ECS instance is not released after you stop the instance, so when you start the instance again, it will start with the same private IP address, network, and storage configuration as before. You can start or restart an ECS instance via ECS Console. Please check Start an instance and Restart an instance for more details. Please kindly make sure that, you stop the SAP instance before you shut down ECS instance. This part introduces the features of Alibaba Cloud which can help you handle the scenarios that require saving the state of your system. Alibaba Cloud Object Storage Service (OSS) is an easy-to-use service that enables you to store, backup and archive large amounts of data in the cloud. OSS acts as an encrypted central repository from where files can be securely accessed from around the globe. OSS buckets can be used to store your disk snapshot, custom image and system copy. Creating a new ECS instance in another Region or Zone with the Custom Image, in this way, you need to update the SAP license after you moved the NetWeaver. Back up non-production system with high efficiency and low cost;You can achieve this by creating snapshots of all cloud disks attached to this ECS instance hosing the non-production system. To obtain a consistent snapshot, you must either stop SAP NetWeaver or stop the database from writing to the file system. To create a snapshot, you can follow the official guide Creating Snapshots from Alibaba Cloud website. Use the Software Provisioning Manager (SWPM) to export the source system. Use SWPM to create a new, target system and to import the data that you exported from the source system. To capture the state of the system disk attached to your ECS instance, you can create a custom image. An image is different from a backup. Image can be used to create new ECS instances, but backup cannot. 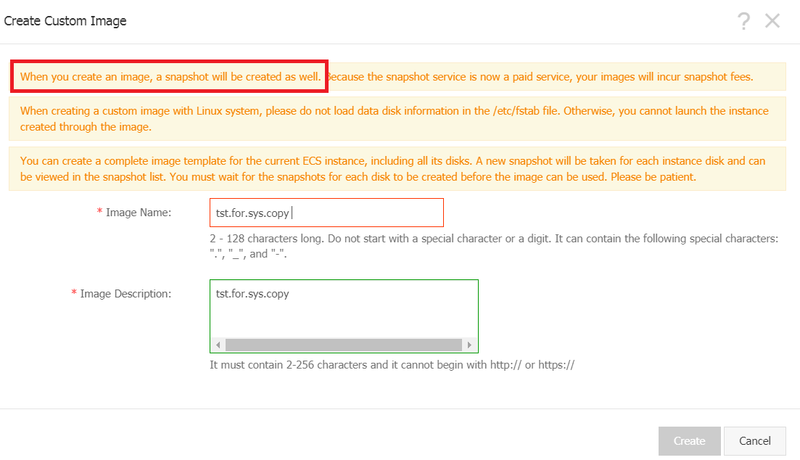 Unless you use the backup of system disk to create a custom image, then use this custom image to create ECS instances. You should have created one or more images at the end of the deployment steps. However, you might want to create new images after you make important changes to the system, such as installing an update of SAP NetWeaver binaries or upgrading the SAP NetWeaver version. In some cases, you may want to move your SAP NetWeaver system from one Region (or Zone) to another. You can achieve this by taking a custom image (including snapshot) of the whole ECS instance hosting the SAP NetWeaver system in the source Region (or Zone) and create a new ECS instance through the custom image. You can keep the same hostname in the new Region (or Zone), if it isn’t in use yet. However, please be kindly noticed that, after you moving the ECS instance from one zone to another, the ECS instance ID will be changed. This means the SAP hardware key is changed, and you have to import a new SAP license accordingly. Cloud Disk Snapshot offers simple and low cost backup service, which can be leveraged to reach requirements of non-production system. It has a very flexible snapshot policy, for example, a user can take snapshots on the hour and for several times in a day, a user can choose any day as the recurring day for taking weekly snapshots, and a user can specify the snapshot retention period or choose to retain it permanently. Please be noticed that when the maximum number of automatic snapshots has been reached, the oldest automatic snapshot will be deleted. For more information about Cloud Disk Snapshot, please refer Alibaba Cloud website. Snapshots can be used to manually restore a whole HANA or Microsoft SQL Server ECS instance of non-production system. For production system, you should leverage the database backup and recovery functions. This part provides general information for managing SAP HANA on Alibaba Cloud. 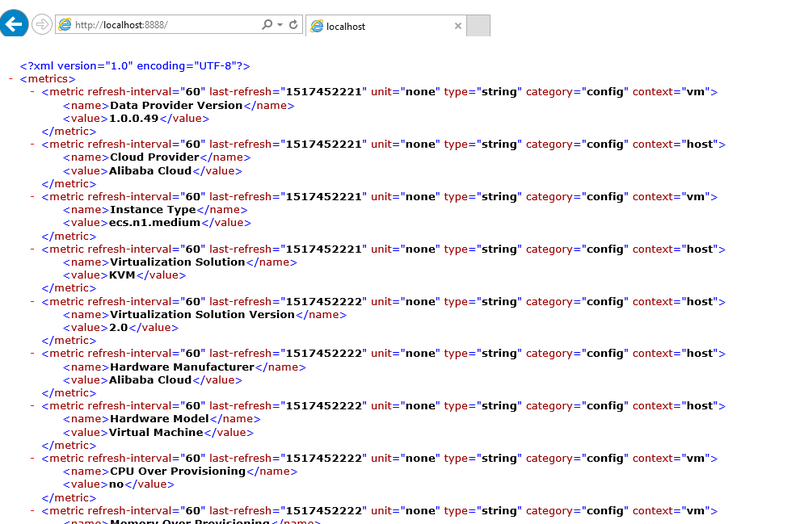 For complete information about running SAP HANA on Alibaba Cloud, please kindly check the SAP HANA on Alibaba Cloud Operations Guide. That guide provides you with detailed information covering administration, backup and recovery, security, networking, and other topics. For more information about running Microsoft SQL Server on Alibaba Cloud, please kindly refer to best practice for running Microsoft SQL Server on Alibaba Cloud. Controlling access to computing resources on Alibaba Cloud is a critical part of securing and operating your SAP system deployment. Although SAP provides its own user-management system, Alibaba Cloud Resource Access Management (RAM) service provides unified access control over computing resources on Alibaba Cloud. From time to time, you may need to add or remove team members or change their access permission level at different phases of an SAP project. You can manage access control by defining who has which access to resources. 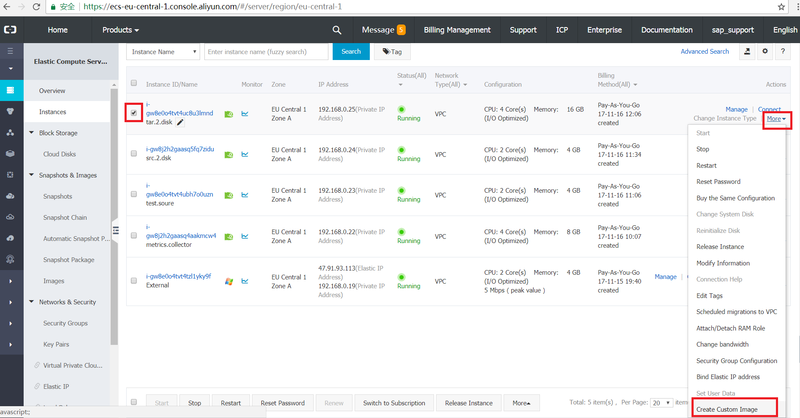 For example, you can control who can perform Alibaba Cloud Console operations on your SAP instances such as creating and modifying ECS instances, VPC settings etc. For more details about RAM, please see here. 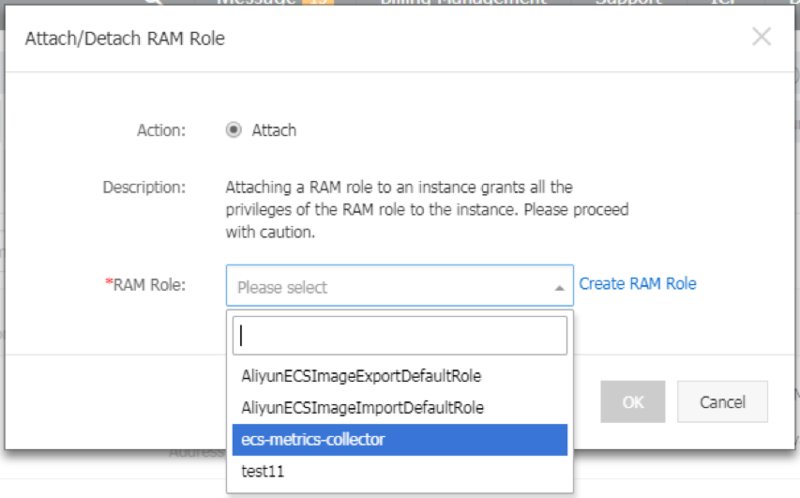 The RAM (Resource Access Management) role of an ECS instance, hereinafter referred to as instance RAM role, grants permissions to the ECS instance by assuming an authorized role. By associating a RAM role to the ECS instance, you can access other cloud services by the temporary STS (Security Token Service) credential from the applications within your ECS instance. This feature guarantees the security of your AccessKey and supports delicacy permission control and management in virtue of the RAM. For more details, please kindly check here. Alibaba Cloud offers SSH key pair logon, which only applies to Linux instances. If you are running Linux, it is recommended that you choose this authentication method to protect your ECS instance’s security. An SSH key pair is a pair of keys generated through an encryption algorithm: one key is intentionally available, known as the public key, and the other key is kept confidential, known as the private key. If you have placed the public key in a Linux instance, you can use the private key to log on to the instance using SSH commands or related tools from a local computer or another instance, without the need to enter a password. For more details about SSH Keys, please kindly check here. The SAP application in a cloud environment runs on a guest operating system (Guest OS) installed inside the virtual environment. SAP Host Agent collects all information required for SAP monitoring and provides it to the SAP NetWeaver local monitoring and Solution Manager to analyze and display. Customer or SAP Technical Support can access the SAP tool through SAP transaction code ST06. In addition to that, Alibaba Cloud and SAP have worked together to create a monitoring agent – ECS Metrics Collector, for SAP NetWeaver running on Alibaba Cloud. ECS Metrics Collector is responsible for gathering information about configuration and resource (CPU \ Memory \ Disk \ Network) utilization from the underlying Alibaba Cloud infrastructure and virtualization platform, and feeding them to SAP Host Agent. Note: You must deploy ECS Metrics Collector on your SAP ECS instance so that you can get support from SAP and enable SAP to meet its service-level agreements (SLAs). Metrics Collector is a local agent that collects metrics, events, and metadata of the hosting ECS instance in Alibaba Cloud, and this monitoring agent runs as a Linux process. Each ECS instance in your SAP NetWeaver deployment must have an ECS Metrics Collector agent. The collected data mainly comes from the metadata server and open API of ECS. SAP Host Agent polls this monitoring agent for its cached data over HTTP service. It aggregates the metrics, reports them, and stores them in the SAP NetWeaver database. 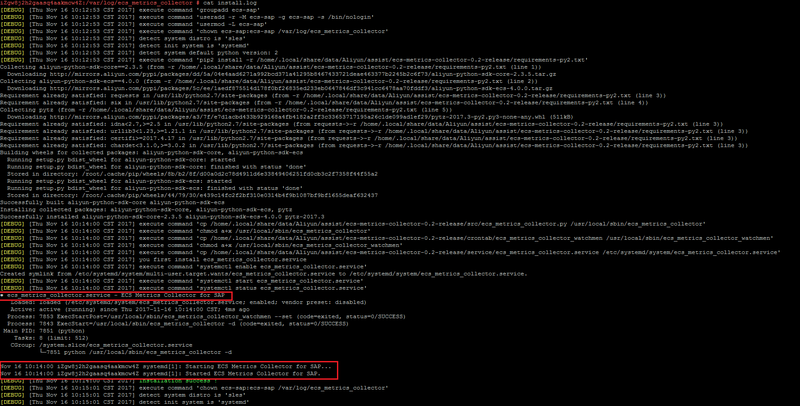 And finally, SAP’s transaction ST06 or the SAPOSCOL command line interface displays the aggregated metrics. ECS Metrics Collector will be automatically started right after the installation. The setting of automatic upgrade will be configured by the installation job. With this setting, ECS Metrics Collector will automatically upgrade to the latest version as long as there is one. Meanwhile, there are crontab tasks defined for monitoring the status of ECS Metrics Collector. It will be restarted right away in case it crashed. On Linux, you can check the status of the ECS Metrics Collector on operating system level. In some special case, you may need to manually restart ECS Metrics Collector. Select the RAM service role you created at the beginning. Click “OK” to attach the role. create a SNAT item for network range where the ECS instance locates. Metrics Collector is a local agent that collects metrics, events, and metadata of the hosting ECS instance in Alibaba Cloud, and this monitoring agent runs as a Windows Service. Each ECS instance in your SAP NetWeaver deployment must have an ECS Metrics Collector agent. 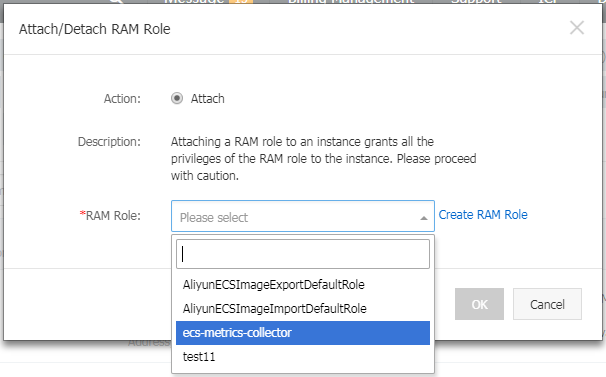 ECS Metrics Collector must be installed manually by users though Cloud Tool (Aliyun Assistant) of Alibaba Cloud during SAP NetWeaver deployment. For detailed steps, please refer to SAP NetWeaver Implementation Guide for Alibaba Cloud. Meanwhile, the ECS Metrics Collector service is configured as restart after failure. It will be restarted right away in case it crashed. 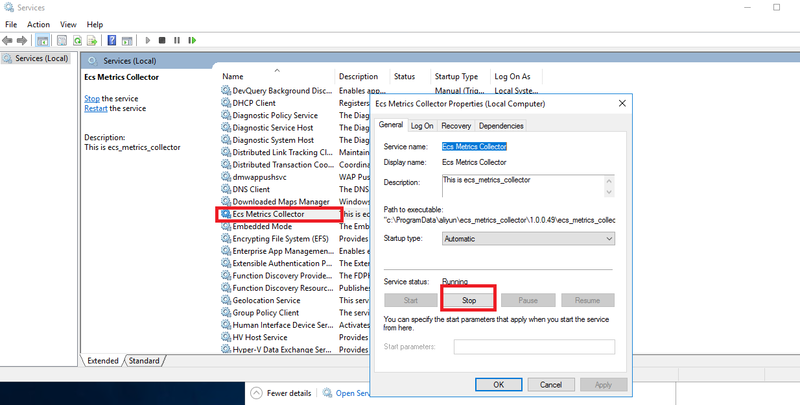 Or you can simply use following command on the command prompt as follows: net stop "Ecs Metrics Collector"